What Is The Most Effective Way To Wash Solar Panels? Washing solar panels is easy when you invest in an automatic solar panel cleaning system from Heliotex. Clean solar panels are more efficient all the way around, but who wants to take the time to climb up on the roof of your home and manually wash your panels when there are better and more effective options for residential and commercial customers? 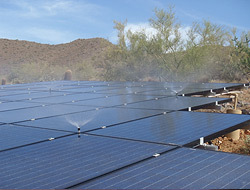 Our solar panel washing systems do the job for you automatically according to how often you’d like washing to occur. 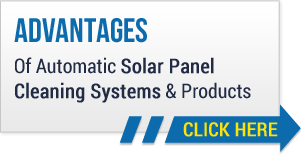 We also offer security screws and security fasteners that fit panels from all of the leading manufacturers including Sharp, Sunpower and more, as well as our solar panel cleaning solution and de-ionized water filter. There is no question as to how solar panels are most effectively kept clean. The answer is a Heliotex system, and we would like to help you learn more about our wonderful cleaning solutions. Call today! Make consistently clean solar panels your reality, and let Heliotex show you how to wash solar panels the easy way. Our products set a standard of excellence in our industry, and will help your solar panels to maintain their standard of excellence as well. Perhaps you are interested in one of our systems, but would like to learn more about them before making your purchase. We would love the opportunity to walk you through the process, introducing you to our product line and explaining the benefits they offer. The more you learn, the more you’ll realize what a cost efficient idea a cleaning system from Heliotex truly is. Now that you know the most effective way to keep your solar panels clean, let’s get down to the business of deciding on the best system for you.